In January of this year I took, what was for me, a momentous decision, and that I had set-up my final exhibition. I took this decision without consulting my wife Sue, who like most difficult changes in our professional life, found it very hard to accept. Many things influenced my decision including my age, but mainly the loss of the excellent exhibition/lecture room at Coolings Garden Centre without an acceptable alternative being offered was the major factor. It is very hard finding somewhere suitable to display one’s paintings, the lecture room was perfect, but is now let to a commercial company and although we tried to exhibit in the Greenhouse last year and put on a excellent exhibition it did not work for us, as well as being freezing cold. What can I say, other than a big thank you to all the customers who supported me during my shows at The Jeffery Harrison Centre in Sevenoaks and at Coolings in Knockholt. Almost 30 Exhibitions and approximately 1,500 original paintings. Phew! So the start of this year I faced with a little fear and trepidation! However so far I have been as busy as any other year. Firstly the 12 calendar plates for 2019 had to be finished to get to the printers in time and the RSPB now commissions a smaller version of my calendar. 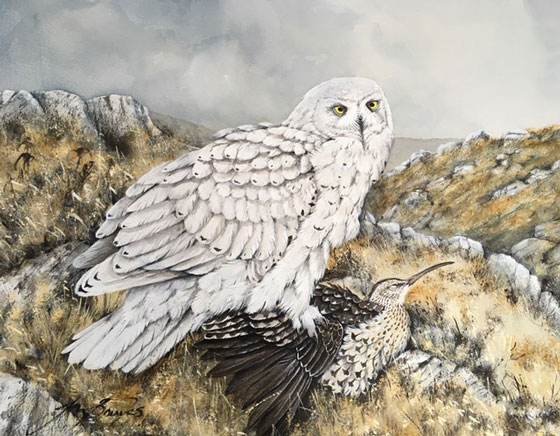 Then a series of commissions to complete including two large pictures for a collector who buys birds of prey, including owls, on prey in British landscapes. In this case a Snowy Owl taking a Whimbrel on Shetland (see below) and the second an Eagle Owl having taken a Pheasant in the Peak District. I then had a surprise visit from my wonderful Chinese clients which ended in buying and commissioning several paintings. With all this we still found time for a wonderful trip to the island of a Tiree, in the Inner Hebrides. We had never visited this island before on all our island hopping trips, although once when sailing in these waters we had seen a distant pod of Orcas just north of it’s sister island of Coll. Tiree is a flat, working island with a fantastic sun record, always windy (no midges) and beautiful beaches. However the highlight to us was the cottage we hired on one of these beaches with fantastic wildlife sightings from the house and garden, a resident population of seals, otters, many species of waders, and a sighting of a Minke whale all without leaving the property. We were a little early in May to see the machair, the carpets of wildflowers that cloak the island in the summer, so a good reason for a return visit next year, also perhaps to Coll. I am also looking forward to an autumn visit this year to the Scillies, I really do love my islands. So I didn’t need to worry in January about the future, this year so far has been as busy as previous ones and I can’t see it changing in the near future although this December will be strange without an exhibition as for the last 30 years, but I think at this stage of my life, I just get on and enjoy it as I always have. My calendar is now available and we have sent our first mailing of flyers out to our mail order customers and orders are now coming in. We will send out the next mailing in October to customers who have come to my annual exhibitions in the past, but as mentioned above, there will not be an exhibition this year to collect, so my calendar will be available by post or from my house by arrangement.